A blog for the "do it yourself" person where I'll share my ventures in thrifting, furniture refinishing, basic sewing and reupholstery projects, and other domestic notions. Two weeks 'til Christmas, and I'm JUST now getting you my version of Miss Mustard Seed's Christmas ornaments that I've already been promising for two weeks. Photo courtesy of Mustard Seed Interiors. Let's just get right to it. I use old hymnals for this project. They're the perfect size, have plenty of double sided pages, and usually already have that nice aged look to them. The ornaments I'm going to show you are pretty large, but you could easily use the same method with even smaller pieces. To remove the pages, score as closely as you can to the binding, and gently pull out. They should release pretty easily. Take your sheet of music paper and fold it in half length-wise. Fold it back and forth a few times, and it should easily tear apart. If it doesn't, use scissors. My paper is pretty delicate, and you don't want it to rip. Starting at one end, accordion fold it like you used to when you were a little girl making paper fans. Try and make your folds the same size. They will end up like this when you're done. Three half sheets will be full enough to make a full circle. The accordion strips have to be attached together. To do this, match up one end of one that points up with the end of another that points down. To get the flattened, circular fan shape, cup the circle in your hand and gently pull the top in as you push down. It will gradually start to flare at the bottom. Put a dab of glue in the center and hold it together, then turn it over and do the same on the opposite side. You now have a flared circle. You can put some glitter on the edges, put your string on it, and leave it as it is if you like at this point. This is how Miss Mustard Seed's look. I take it a few steps further. To make the inner circle, take one of the long set of three strips you've already made. Push the accordion folds tightly together, and cut it in half. Glue the ends together just as you did for the larger one. Then gather it in your hands and dip the ends in glue. Then dip the ends in your glitter. I use a crushed glass glitter. Then you'll need to sit it on top of the larger circle and push down, just like you did with the larger circle. This sits it down in the grooves of the other circle so it looks more cohesive. Very gently, push inward until the smaller circle closes in as well as it can on the larger one. Put a dab of hot glue in the center, and hold it in place until it sets. Pick up the two circles as a unit, and dip the outer circle in the glue, and then the glitter. I finish the centers of mine with a set of vintage buttons attached with hot glue. The last step is to attach your string. I use a thin hemp string. Punch a small hole through one of your seams so that you have double thickness for strength. You want the hole to be big enough for your string to fit through, but not excessively big as to invite tears. Tie a knot, and wait for your glue to dry. It will dry clear, and you'll be left with pretty glass glittered edges. Hang on your tree, and enjoy! Hope you're all having a great holiday season! 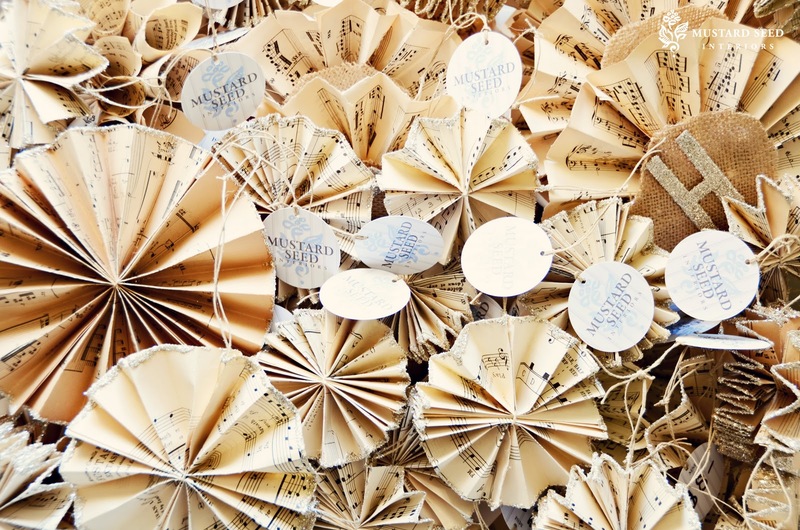 A great tutorial for these sweet paper ornaments! I love how they turned out. Many uses for these pretty ornaments! Nice stopping by to visit with you! Hi Kayla. Your ornaments turned out so pretty. I love seeing tutorials and tips on how others create and you did a great job with the tutorial. I say you over at the 2805 Potpourri Party when I posted my accordion fold project. Now I'm your newest follower by gfc and email. Hope you had a Merry Christmas here in the Midwest! I love these ornaments and hope to make some for next year! I love to hear from you! If you have a detailed question, please email me at ConfessionsofaDIYaholic@gmail.com. I'm a stay at home mom to sweet boys, and married to the man of my dreams. I'm your typical jack of all trades type of gal, and love any sort of project. I'll drag just about anything home if I think I can make it into something fabulous (much to Hub's dismay). I believe anyone can do anything you set your mind to as long as you don't limit yourself! Believe you can do it, educate yourself, and make it happen! Like my blog? Show me by joining to be notified of new posts!